If you haven't heard yet, Facebook has announced new changes that will be coming to Ads Manager on April 2019. 1) Post Saves is one of the new metrics that will be replacing Offers Saved & Costs Per Offers Saved. It measures the number of times your ad has been saved and this metric has already begun gradually rolling out as of March 12th, 2019. 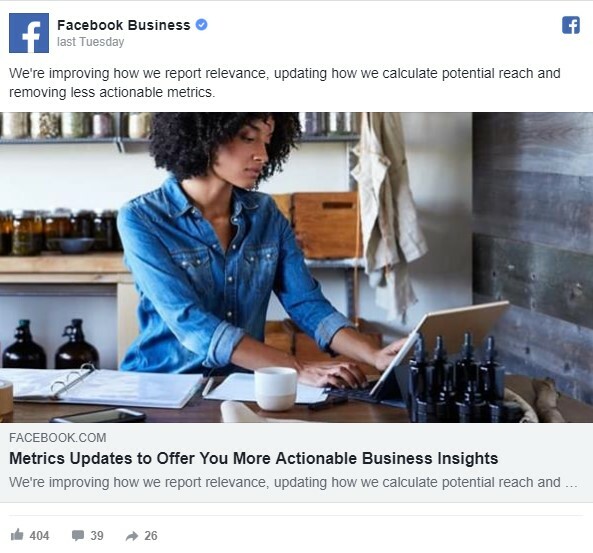 2) Facebook has received feedback from marketers that Messaging Replies was not a valuable metric because it could not track new conversations. So, they will be replacing those metrics with New Messaging Connections & Messaging Conversations Started to address this issue. 3) ROAS (Return on Ad Spend) will now be consolidating channel-specific data (ie. Mobile, Web, On-Facebook) into one Purchase ROAS metric because a customer journey to purchase is now becoming increasingly omni-channel. What are your thoughts on these changes? Will this affect how you've been running your ads? Will this affect how you've been running your ads? I can't see how. I drive visitors to my site and track their engagement there. For the "average" FB advertiser, these metrics will be meaningless. They won't know how to interpret the collected data. I'm old school, got started in print advertising kind of thinking. To me, "engagement" advertising is just paying FB to drive traffic to their own site, it's counter-intuitive. But if you can make a profit that way I guess FB metrics may be useful. The changes will not affect how I run ads for my business. The changes will affect how a small majority of my clients will want to run ads for their businesses simply because they were confused before and will be more confused now. Albeit, that is why they pay us other than to increase their website visitors. Seriously, the only change that would be beneficial to all of us with small ad budgets would be a substantial decrease in adspend. Entrepreneurs starting out and small businesses without giant staffs and budgets. I dont think it will make much difference . User interfaces are changed on many websites periodically. Its purpose i to IMPROVE user ability to interact. Very interesting, Fb ads have been on and off recently. I believe these features especially post saves might change things up. Really? Care to elaborate more on this? Wow! Very interesting, I think it will very well for all. Very interesting and nice update. Lets watch and see the effectiveness. I don't see any changes that could affect how the algorithm works. Just some changes in the features names. They also introduced a budget management feature on the campaign level, which turned out to be one of the worst changes that Fb did. This will not make much difference, i was expecting a bigger update that will affect this shopify sellers. How can you be seller a product of $2 for $60 and then the buyer will still wait for 20days to receive it. Weird! Didn't know about this until today, thanks for sharing! I don't think there should be many changes, but I guess its best to see how it goes first. Hey, Very interesting Facebook Ad Update. We will be waiting for the new Ads Manager changes.